Microsoft releases a trial version of its Office 2013 for testing purpose. The Office 365 is a new product of Microsoft Office 2013 application package. It works only a 30 day once it is installed to your computer without valid license key. 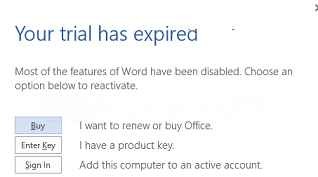 But, Microsoft also reveals a tool that helps you to reset the trial time of office 2013. It can be entered a total of 6 times and provides you to use the office 2013 up to 180 days free of cost. Tips to Extend Office 2013 Trail Time by 180 days ? At first, go to the following folder in the computer C drive. If you are using to 64 bit of windows version then explore the following paths. If you are using to 32-bit of windows version then browse the following paths. 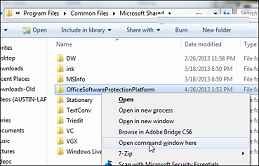 Then hold the Shift key down and right-click on this folder (OfficeSoftwareProtectionPlatform). From its right context menu, click on Open command Window here option. Now the trail version of office 2013 package is ready to use for another 30 days on your computer after following the above tips. Thus, you can use above all steps 6 times to free enjoy the Microsoft Office 2013 up to 6 months.